SPACEPORT NEWS December 17, 2004 Page 2 Awards The Kennedy UpdateJim Kennedy Center DirectorTHE NASA December Employees of the Month, standing from left, are: Cindy Gooden, Equal Opportunity Office; Laurie Brown, Information Technology and Communications Services; Debbie Clarke, Chief Financial Office; and Judith "Charlie" Blackwell-Thompson, Shuttle Processing. Seated in the front row, from left, are: Vicki Miletello, Cape Canaveral Spaceport Management Office; Michael O'Neal, Spaceport Engineering and Technology; and Jessica Rodriquez, International Space Station and Payload Processing.December Employees of the MonthOKEEFE . .(Continued from Page 1)Happy holidays, everyone! 2004 was a busy year, but I hope youre able to find some quiet time with family and friends and enjoy the next two weeks. My holiday wish is to have everyone back safe and sound in 2005! 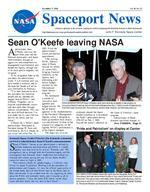 As you have heard by now, Sean OKeefe is leaving NASA. He was asked to be a candidate as chancellor at Louisiana State University, which he intends to accept. Sean will stay on board with NASA until a new administrator is selected. Sean has proven to be an excellent leader, leading us through the difficult times of the Columbia accident and boldly putting in place the right strategies for the new Vision for Space Exploration. We wish Sean, Laura and their family much success in his new career; we know he will excel in his leadership to LSU. This has been a special month, and I appreciate everyone turning out for both the KSC holiday picnic and holiday coffee. They were both spectacular events as we honored our hurricane heroes and socialized with our KSC family. I thank everyone who took the time to throw two first-class events. Judging by the smiles and feedback, thousands of people had a very enjoyable time. I want to thank the KSC One NASA Team for the super Leader Led Workshop held yesterday. I hope everyone had a chance to attend or catch the main session on NASA TV. It was super to have leaders such as Fred Gregory, Retired Adm. Craig Steidle and Lynn Cline share with us their views on the Agencys transformation and brief us on the progress of the Vision for Space Exploration. After hearing their presentation, Im excited about Return to Flight and the challenges in 2005. Congratulations to our Space Shuttle program on two significant Return to Flight milestone accomplishments that will be completed by the end of the year. First, all three of Discoverys main engines were installed and are ready for final processing for the May-June launch. Second, by the end of next week, stacking of the Solid Rocket Boosters for STS-114 will be completed. With the external tank set for arrival in early January from Michoud, its obvious the wheels for Return to Flight are quickly turning. My congratulations to the team, and I look forward to the external tank arrival after the new year. January 3, 2005 represents a special day for many people, as this is the official retirement date for several NASA employees. Im sure many of our contractor partners are making retirement plans, as well. I want to personally thank all of you for your faithful service to our Agency and country, whether it was for 20, 30, or in some cases, 40 years and beyond. The legacy of accomplishment you leave behind is what we will build upon to achieve the Vision for Space Exploration. When an American astronaut lands back on the Moon, then on Mars, and one day travels beyond our universe, you can rest assured your work played a part in our success. So to all of our retirees, God bless, good luck, and enjoy your golden years! To everyone, from Bernie and me, have a joyous holiday season, a wonderful new year, and well see everyone back here safe and sound in 2005! "When an American astronaut lands back on the Moon, then on Mars, and one day travels beyond our universe, you can rest assured your work played a part in our success." the Space Shuttles safety and management programs. He was a key architect of the presidents new Vision for Space Exploration, announced in January during a historic speech at NASA Headquarters in Washington. The new Vision for Space Exploration led a transformation of NASA and has positioned the Agency to meet the challenges of safely returning the Space Shuttle to flight, completing the International Space Station, exploring the complexities of our home planet, and going back to the Moon, on to Mars and beyond. The president and Congress have demonstrated their faith in us, added Administrator OKeefe. We need to seize this opportunity. NASA has a new direction that will push the boundaries of technology, science, space flight and knowledge, and will inspire new generations of explorers for years to come and secure this great nations future. Encouraging students to study mathematics, science and technology has been a priority for the administrator. In April 2002, he unveiled a new Educator Astronaut Program, in which a select few of the most outstanding teachers would be chosen to join NASAs Astronaut Corps. The new Educator Astronaut candidates were introduced in May on Space Day. During his tenure, Administrator OKeefe realized a number of significant mission triumphs, including Cassinis exploration of Saturn and its moons, the recent successful hypersonic test flights of the X-43A and the historic landing of the twin Mars Exploration Rovers Spirit and Opportunity on the red planet in January. SPACEPORT NEWS Page 3 December 17, 2004By Jennifer Wolfinger Staff WriterImproving the professional aptitude of others has simultaneously strengthened Karen Childrees outlook, and these skills recently earned her Kennedy Space Centers Employee of the Year award. As a Launch Services Program administrative specialist and training coordinator, she works with supervisors and employees to ensure the work force is adequately trained. Since training is a vital part of maintaining and improving our efficiency and effectiveness in the launch business, my goal is to help our employees reach and exceed their potential, said Childree. But she didnt receive the honor for simply meeting job requirements. I always try to do my best and be helpful and understanding when problems arise, said Childree. I work toChildree helps others 'exceed their potential'find solutions that will benefit all parties concerned. She benefits from her hard work just as much as those she helps. I was humbled and very grateful for the honor, Childree said. I enjoy working with people and personally feel satisfaction helping employees get the training they need to achieve their goals. With the exciting state of her personal life, its no wonder she eagerly tackles the daily grind. In June she married Edwin, who she sings with in her church choir, and now spends her spare time traveling, swimming and golfing. What a year this has been newly married and receiving Employee of the Year, she said. These very obvious high points of the year, plus the privilege of working with such a wonderful, very intelligent group here in Launch Services, gives me so much to be grateful for.IN JUNE, Karen Childree, a Launch Services Program administrative specialist and training coordinator, married Edwin, who she sings with in her church choir. She now spends her spare time traveling, swimming and golfing. "What a year this has been newly married and receiving Employee of the Year," she said, adding "these very obvious high points of the year. "By Linda Herridge Staff WriterSafety and training are very important to Ralonda Farrant, an administrative specialist in the business office of the Spaceport Engineering and Technology (SE&T) directorate. Her work includes coordinating the on-site, off-site and security training of 273 workers, as well as 22 co-op students. Training topics include area access, safety, security, information technology, conferences, academic subjects and ethics. Among these, Farrant says the hot topics include area access and the Voluntary Protection Program safety classes. She was selected as SE&T Employee of the Month in July and subsequently received the 2004 Employee of the Year Award for outstanding dedication and support for SE&T administrative and personnel requirementsand providing superior commitment and serviceNASA's Farrant stresses importance of safetyto the SE&T directorate employees. The award is well deserved, said SE&Ts Business Office Chief C. David Shelton. Her efforts directly support the entire directorates work force on an individual-by-individual basis. Receipt of this honor is testament that her co-workers respect, value and appreciate her support and assistance in training and administrative matters. In 1989, Farrant started as a co-op student in what was the Design Engineering directorate. In 1990, NASA hired her to work in that directorate. After the current reorganization, she remained in SE&T. I was surprised and appreciate the recognition, Farrant said of the award. My co-workers are great. I really enjoy Farrant also coordinates the personnel actions, orientations and Accelerated Training Program for co-op students hired as NASA full-time employees and serves as the directorates property coordinator. The Titusville native attended Brevard Community College, where she earned an associate degree in Office Automation in 1990. One of her outstanding memories is getting hired by NASA in her current position. Farrant is married and has one daughter. She enjoys taking weekend trips to nearby Florida locations including the Merritt Island National Wildlife Refuge, and also visits family in North Carolina. Farrant summed up the importance of training. Training helps keep the workers up-to-date on their job skills, and training for safety and security is vital so workers can perform their job safely. my job. Her current projects include serving on the KSC Area Permit Working Group to determine new area access requirements. She is also a member of the Canaveral Spaceport Technical Training Users Group, which keeps her aware of any new technical issues that require workers to receive appropriate training.RALONDA FARRANT, an administrative specialist in the business office for Spaceport Engineering and Technology. Page 4 SPACEPORT NEWS December 17, 2004 Holiday Celebration brings NASA employees togetherThe 2004 KSC Holiday Celebration at KARS 1 Park recently gave NASA civil servant employees a chance to wish each other happy holidays and enjoy great food and fun. A group of children, all 4 years old, captured the audiences attention with a heartwarming Pledge of Allegiance, followed by Ivette Riveras singing of the National Anthem. The event was also a chance to recognize members of the Combined Federal Campaign for their hard work in exceeding this years goal. A check for $389,000 was presented to United Ways Frank Ramsey by the team. In addition, attendees enjoyed a traditional holiday dinner, live entertainment and door prizes.THE KSC HOLIDAY CELEBRATION was also the occasion for presenting the Center's Combined Federal Campaign check to United Way of Brevard. The 2004 campaign netted $389,000 in donations. At right is Center Director Jim Kennedy. Next to him, at left, is the campaign chairman, KSC's Chief Financial Officer, Nap Carroll. NASA CIVIL SERVANTS enjoyed a traditional holiday dinner at this year's Holiday Celebration. THIS GROUP of 4-year-olds from the Child Development Center opened the celebration with the Pledge of Allegiance. CENTER DIRECTOR JIM KENNEDY enjoys the company of two employees while playing Santa Claus with a child at the 2004 KSC Holiday Celebration. Page 5 SPACEPORT NEWS December 17, 2004 Center Director Jim Kennedy invited all Kennedy Space Center employees to the annual Holiday Coffee Dec. 14, where workers exchanged greetings with friends, co-workers and former employees at the Headquarters Building. Employees also had a chance to talk to members of the STS-114 Return to Flight crew. Refreshments were provided on every floor.Holiday Coffee gives employees chance to reflectSTS-114 CREW MEMBER Wendy Lawrence talks to two employees at the Dec. 14 Holiday Coffee. THE HOLIDAY COFFEE featured refreshments on every floor of the Headquarters Buildingand a chance to meet other members of the Center work force. NASA RETIREES are invited back to the Center for the annual Holiday Coffee, including Robert Yarbrough (left) and Edward Taylor. SOME OF "Santas helpers" who helped coordinate the Holiday Coffee included, from left, Rose Rayfield, Michelle Foster and Pat Christian. STS-114 CREW MEMBER Andy Thomas (left) talks to External Relations Deputy Director Jack Fox (with hat) and other Center employees. THE FIRST FLOOR of the Headquarters Building was standing room only for the annual celebration. SPACEPORT NEWS December 17, 2004 Page 7By Jennifer Wolfinger Staff WriterWe all know food energizes our bodies, but corn and other grain products are now providing ethanol fuel for several hundred vehicles at KSC. Housed at the station behind the Headquarters Building, the renewable energy is typically produced from corn and other grain products relying on the fermentation of the plants sugars. Its a constant resource that doesnt deplete oil supplies, said Dennis McGilvray, station owner. This fuels other name, E85, refers to its 85-percent ethanol composition. The remaining 15 percent is gasoline. While it causes slightly reduced mileage and power, E85 does reduce greenhouse gas emissions and is biodegradable. E85 also lessens our foreign fuel co-dependency. Selling for nearly the same price as unleaded gasoline, ethanol isCenter opens first ethanol fuel station for vehiclesdomestically produced, making U.S.-grown feed grains more valuable. Additional ethanol resources, such as agricultural and forestry wastes, are under investigation. Wood, cheese whey, potato and brewery waste are a few specific examples that may prove economical. After ethanol is produced, the remaining protein, minerals, vitamins and fibers are sold as livestock feed. Carbon dioxide escapes through processing, but no need to worry; crops capture the emissions as nutrients and the cycle repeats. In the case of a spill, ethanol also poses less environmental risk than oil or gasoline, as ethanol degrades quickly in water. Alternative fuel vehicles run on ethanol or gasoline. However, gasoline engines shouldnt fill up on E85. Recognizing E85s benefits, the Center not only welcomes the fuel, but is home to 364 ethanol-compliant vehicles as well. This effort is a response to a 1992 presidential Energy Policy Act.BRUCE CHESSON, NASA traffic management specialist, and student intern Jennifer Alvarado pump ethanol fuel into alternative-fuel government vehicles at the Citgo gas station behind the Headquarters building.Ethanol vehicles are called Flexible Fuel Vehicles (FFV) due to their ability to run on ethanol (E85), gasoline or any combination of the two fuels. E85 is a blend of 85 percent denatured ethanol and 15 percent gasoline. Ethanol is produced mainly from corn, but can be made from virtually any starch feed stock such as sugar cane, wheat or barley. Because ethanol is produced from crops, it is a renewable fuel and reduces the nations dependence on imported oil. The adaptable fuel has grown in popularity. There areFacts about ethanol vehiclesapproximately 100 refueling sites in North America, and a continually developing infrastructure. FFVs automatically adjust for any mixture for environmentally sound driving. On-board sensors monitor the fuel mixture and the on-board computer adjusts spark timing and fuel flow to optimize performance. Flexible Fuel Vehicles, including those that meet California emission standards, can be ordered and serviced through any dealership. Executive Order 13149 requires that federal fleets must decrease their petroleum use by 20 percent by 2005.Second Kennedy Space Center Store opens in Orlando International AirportAPOLLO 17 Commander Gene Cernan autographs his book for attendees at the recent grand opening ceremony of the second Kennedy Space Center Store at Orlando International Airport. KSC Director Jim Kennedy and Cernan participated in the grand opening ceremony. The store will help educate millions of airport visitors about America's space program and is operated by Delaware North Parks and Resorts.